I like your brand and love your products, but wish you would like me more back. You see, recently I received an eMai l from your Brand, recognizing me as a loyal customer. And there was exciting news for me! 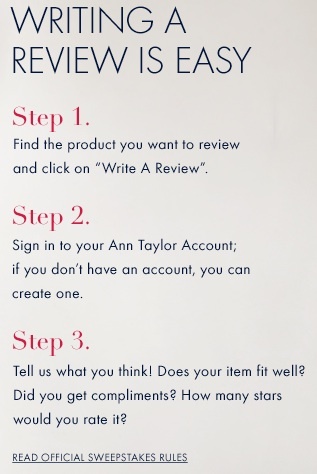 Ann Taylor is starting product ratings and reviews. The message encouraged that if I would just click-through to try it out, Ann Taylor would register me for a shot at a $500 gift card. then actually do the review. Really? Seriously? “Wait a minute,” I thought, "That can’t be right. I mean, they already know what I’ve bought. I can look at my com plete purchase history any time I want to by logging in.” But nope, those dots weren’t connected in this case. Although, I expected to be taken to the product page of my most recent purchase to review, that "heavy clicking" was left to me (um, did I mention “busy professional?”) And now a perfect touch point opportunity to draw in a loyal customer had been squandered on a simple mistake to not launch reviews in a little more thoughtful (integrated) manner. So, let’s back up and consider how Ann Taylor should have done this. First, bear in mind, I still love the products and like the brand. And if I didn’t, I wouldn’t have asked my team to let me take over this "virtual podium" of sorts and make this post. But after all, I manage a marketing technology firm that specializes in this stuff – CRM, Loyalty, and Customer Intelligence. So, while this experience might not seem like much of a problem for some customers, I'm pretty sure this was not the kind of rich rewarding customer user experience that Ann Taylor Marketing or I.T. intended when it went live. Where did it probably go off the rails? I mentioned connecting the dots. Let’s do that. Ann Taylor has all of my purchase history in a database—a well thought out customer marketing database we would assume. Ann Taylor also knows I am a registered user on their site with a fairly good RFM score and active visit and shopping history. 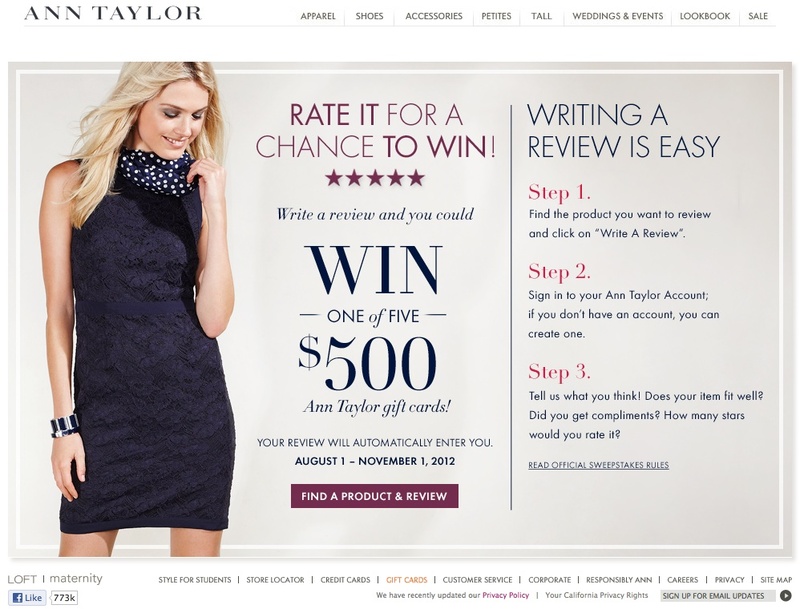 Ann Taylor put together a system for product reviews that simply needed to be fueled by this customer intelligence they already have. But they appear to have fallen short; perhaps for want of time to launch or some other limiting choice or decision. Actually, it appears the ball dropped in campaign management. This is where the initiative should’ve been better engineered to: [a] draw on their customer data, in order to [b] drive their messaging, and [c] populate the message with the appropriate links, to then [d] bring me (click free) to my most recent purchase’s product page to rate that product and hopefully write that review (for CRM and customer intel, unstructured data of free form text in the form of reviews is very useful in addition to the structured rating data... but that's another blog post). To put a fine point on it, this is the essence of an integrated CRM strategy: where the “system” -- comprised of the marketing database, the ratings and review system, and the eMail campaign management platform -- is properly orchestrated and fully leveraged as a unit to create mutually high value customer touch points. Sure, it may be some quirky implementation requirement of the contest for the Reward Card, I don’t know; and if I were not a customer of Ann Taylor who just happens to have spent my last 28 years in CRM, loyalty, and direct marketing, I probably wouldn’t have cared whether it was simply a goof in implementation of the contest or messaging campaign. In that case, all I would care about is that I just had a nearly useless customer experience. In fact, as applied here, our tenet of SMART messaging just went down like the Hindenburg. We’ve written lots about SMART messaging, but to review, all campaigns should adhere to five principles; that is, be Succinct, Meaningful, Actionable, Relevant, and Timely. And you can see it: this campaign tripped, stumbled, and fumbled both action and relevance. And the message was accordingly irrelevant because it failed to tie the action to something that mattered directly to me: the satisfaction I had with my particular product purchase—not just any purchase I’ve made, or knew a friend who made, or a gift I had received, etc. 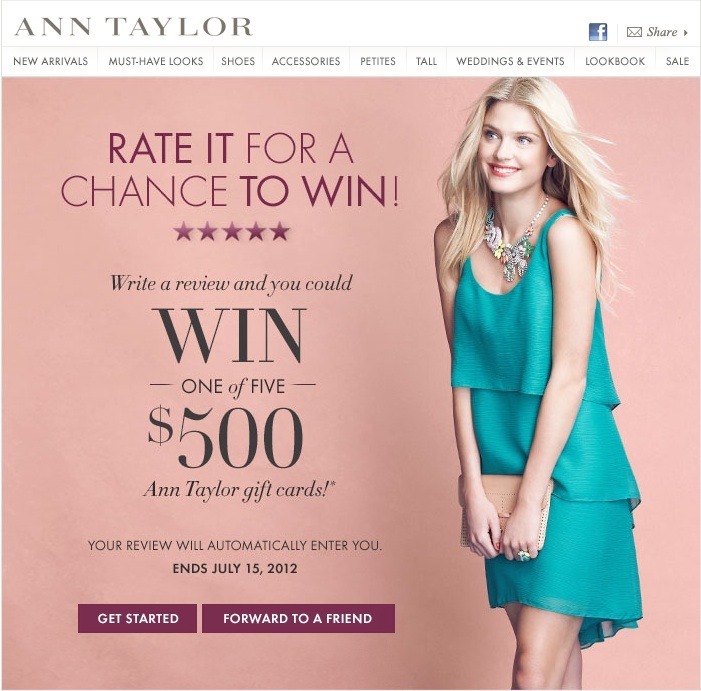 So, Ann Taylor very likely has the data to have done this right, but apparently that data was either trapped, or not easily (or readily) accessible, or there was some quirk in making it work with the contest offer, or (heaven forbid) no one simply thought through the solution to connect the product review opportunity with an actual product purchase (for those who had bought online anyway). The result was largely a non-actionable irrelevant message and a huge missed opportunity to engage their customer. And, an important opportunity this is (was) because Ratings and Reviews are a powerful way to connect your customers with your brand, build a sense of community, and provide a proverbial “Canary in the coal mine” for product development, customer service, and marketing. So what should Ann Taylor have done? Not that I am suggesting they copy another solution, but let’s start by comparing how another brand we work with has pulled off product reviews. NIKE has extensive product review and ratings capability. Here’s how it works. At Nike.Com a customer purchases product. 10-14 days after shipping once Nike “knows” the product has been shipped (and with the time lapse likely delivered), an eMail is keyed off of the estimated delivery date and sent to the purchaser (whose address was included as part of the transaction for notifications purposes). The eMail content is the offer to review/rate the product(s) purchased and in a nice manner: the message includes clickable thumbnail pictures of each product purchased and the call to action. Clicking through the thumbnail takes the recipient directly to that product description page with a prominent Rate & Review button. Here is what C[IQ] would suggest to ratchet that process up for the Ann Taylor Ratings & Review campaign. I’m betting in Ann Taylor’s case, they were trying to cover a few too many bases with a single message. You see, one can imagine that not all loyal customer eMail recipients purchase online, and some of them purchase in a physical retail store. Fine. What we would do is make 2 list pulls: one for those who’ve recently purchased on line, and one for those who have not. Let’s call the latter pull a more “generic” message and the former the more personalized or tailored message for the online shopper. For the generic message, which could largely be the creative that Ann Taylor sent in this case, language could be added that recognizes the recipient has not made a recent purchase online, but they may have bought in one of Ann’s stores or received a gift of an Ann Taylor product, and encourage them to look-up that item to review. Now here is another way to improve on that if there is some registration information required (i.e., the Gift Card raffle registration). Ann Taylor’s CMDB should have a record flag set to indicate if the customer has ever activated an online shopping user account. If they have an account, then a log-in session could be presumptively established (similar to how Amazon.com functions), so that the recipient could be logged in through the URL path, thereby avoiding the log-in step to register for the Reward drawing. An authentication step could easily be added if necessary, again, as Amazon.com does. The personalized version would be an elegant solution: the link would send the user directly to the product page of their most recent purchase with the review button ready (and log-in that user to a session state if authentication data were required.) In this manner, the valuable time of the customer is optimized, the message becomes fully actionable and relevant, and the brand (in this case, Ann Taylor) delivers on its promises, catering to the customer in an appealing manner. Now to me, that would be a well tailored message (if you'll pardon the pun).